Strung Together are a modern take on the classic string quartet. This quirky four-piece outfit combines smooth vocals with funky instrumentals, and brings you classic tracks with a difference. Perfect for an afternoon drinks party or chilled evening do, and they would also be a delightful choice of wedding ceremony music. From £1,400 for 1 and a half hours of live music in either two 45 minute sets or 1 set. They create such a gorgeous happy sound. You can’t help but smile when you listen to them. They were perfect for my summer wedding. Thank you so much for recommending them. When we asked High Row music to help us with our wedding music we were completely unprepared for the exceptional quality of both bands! Strung Together provided the music for the wedding itself and the drinks reception afterwards. What an amazing band!! 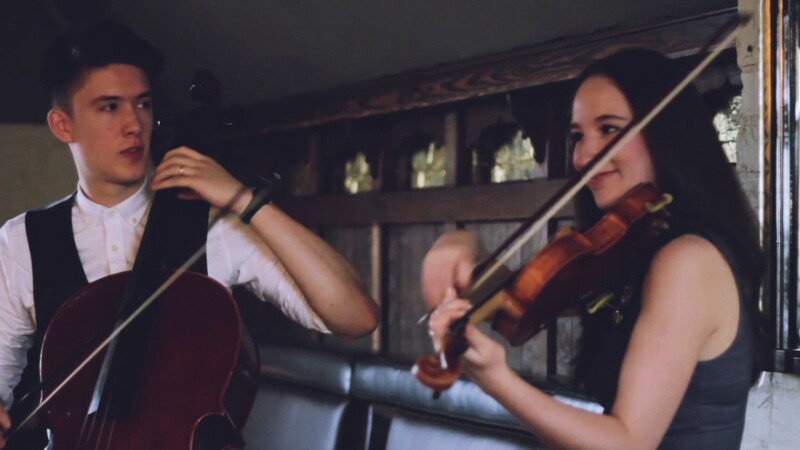 Their ability to put their own twist on the latest songs is unbeatable, they helped create a lovely relaxing atmosphere suitable for any garden party, just what you want when talking to guests. or click below to arrange a booking. We’d love to hear about your event and how we can make your day extra special. Give us a call, drop us an email or use our online contact form to get in touch.